Deep peroneal nerve block is one of the 2 deep nerve blocks at the level of the ankle. The deep peroneal nerve block is easy to perform and may constitute part of an ankle block. The deep peroneal nerve block is useful for anesthesia and postoperative analgesia to surgeries of the first web space (eg, Morton neuroma). It can also be used to treat chronic pain conditions like anterior tarsal tunnel syndrome. The common peroneal nerve (root values: L4, L5, S1, and S2) winds around the fibula through the fibular tunnel. The tunnel is bordered by the peroneus longus tendon and the fibula. Just distal to the fibular tunnel, the nerve divides into the superficial and deep peroneal nerves. The deep peroneal nerve (or the anterior tibial nerve) begins at the bifurcation of the common peroneal nerve, between the fibula and upper part of peroneus longus. [1, 2] In the distal one third of the ankle, the nerve is located between the tibialis anterior and extensor hallucis longus muscles and is superficial to the anterior tibial artery. At an average distance of 12.5 mm proximal to the ankle, the nerve crosses deep to the extensor hallucis longus tendon and courses between the extensor hallucis longus and extensor digitorum longus tendons. The image below shows the nerve and adjacent structures. Deep peroneal nerve and adjacent structures. 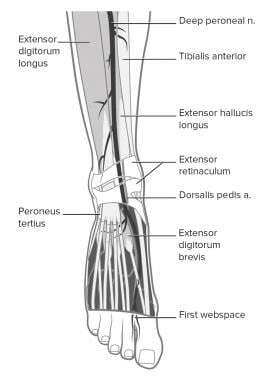 In the leg, the deep peroneal nerve supplies muscular branches to the tibialis anterior, extensor digitorum longus, peroneus tertius, and extensor hallucis longus. It also provides an articular branch to the ankle joint. The deep peroneal branch continues into the foot along with the tibial artery and the vein. It passes beneath the dense superficial fascia of the ankle. Then it divides into lateral terminal and medial terminal branches. The lateral terminal branch (external branch) passes across the tarsus anterolaterally, enlarges and supplies the extensor digitorum brevis. From the enlargement, 3 minute interosseous branches (dorsal interosseous nerves) are given off, which supply the tarsal joints and the metatarsophalangeal joints of the 2nd, 3rd, and 4th toes. The medial terminal branch (internal branch) accompanies and runs medial to the dorsalis pedis artery along the dorsum of the foot. At the first interosseous space, it divides into dorsal digital nerves, which provide sensory innervation to the first webspace and the adjacent dorsum of the foot. As a prelude to neurolysis or radiofrequency ablation of the deep peroneal nerve. Infiltrate area of skin for nerve block with 0.5-1 mL of lidocaine 1%. Alcohol, povidone-iodine (eg, Betadine), or chlorhexidine (Hibiclens) preparatory solution. Position the patient supine with the toes dorsiflexed to identify the tibialis anterior, extensor hallucis longus, and extensor digitorum longus tendons. Foot with surface landmarks. Note the course of the deep peroneal nerve and its relation to the dorsalis pedis artery. Perform a careful neurological assessment prior to the procedure. Identify the tendon of extensor hallucis longus by big toe dorsiflexion against resistance. A groove is felt just lateral to the tendon. The deep peroneal nerve lies lateral to the tendon and the dorsalis pedis artery. Lateral to the nerve is the tendon of the extensor digitorum longus. The needle entry site is about 2 cm distal to the intermalleolar line, just lateral to the dorsalis pedis artery pulse. After the skin is prepared, raise a skin wheal with the 0.5-1 mL of the local anesthetic. Next, advance the same needle and syringe that contains the local anesthetic through the skin in a perpendicular manner until bone is encountered, usually within 2-3 cm. Withdraw the needle slightly to prevent periosteal injection. Patients may experience paresthesia in the first web space. If paresthesia occurs, withdraw the needle slightly until the paresthesia disappears. After careful negative aspiration for heme, inject 2 mL of the local anesthetic. To increase the block success, the needle may be redirected 30º medially and laterally and an additional 2 mL of the anesthetic injected. Remove the needle and apply firm pressure to prevent bleeding. If the condition has an inflammatory component, methylprednisolone 40 mg or triamcinolone 40 mg may be added to the injectate. Insert the needle immediately lateral to the extensor hallucis longus tendon but medial to the dorsalis pedis artery. The deep peroneal nerve is one of the 2 deep nerves at the ankle. The deep peroneal nerve may be blocked as a part of a total ankle block. The deep peroneal nerve innervates the first web space. At the malleolar level, the deep peroneal nerve is located between the tendons of extensor hallucis longus and extensor digitorum longus, in close proximity to the dorsalis pedis artery. To increase the block success, redirect the needle 30º and inject additional local anesthetic after the initial injection. Careful neurological assessment is important prior to the procedure; it helps avoid later attribution of preexisting neurological deficits to the nerve block. The block is essentially safe block to perform, but some complications can occur. Intravascular injection: The dorsalis pedis artery should be carefully palpated to minimize the chance of intravascular injection of local anesthetic. Ecchymosis and hematoma: These complications can be avoided by applying firm pressure to the injection site after the injection. Paresthesia: To avoid needle-induced trauma to the nerve, withdraw the needle slightly before the injection. Gray H. The sacral and coccygeal nerves. Bartleby.com. Available at http://www.bartleby.com/107/213.html. Accessed: April 21, 2008. Lee JH, Lee BN, Lee MY, An X, Han SH. The significance of tibial and common peroneal nerves in nerve blocks. Surg Radiol Anat. 2013 Apr. 35(3):211-5. [Medline]. Lawrence SJ, Botte MJ. The deep peroneal nerve in the foot and ankle: an anatomic study. Foot Ankle Int. 1995 Nov. 16(11):724-8. [Medline]. Hoerster W. Blocks in the area of the ankle. Zenz M, Panhans C, Niesel H, eds. Regional Anesthesia. Year book Medical Publishers; 1988. 88. Ankle block. Dartmouth-Hitchcock Medical Center Web site. Available at http://bit.ly/fGlnLF. Accessed: May 7, 2008. López AM, Sala-Blanch X, Magaldi M, Poggio D, Asuncion J, Franco CD. Ultrasound-guided ankle block for forefoot surgery: the contribution of the saphenous nerve. Reg Anesth Pain Med. 2012 Sep-Oct. 37(5):554-7. [Medline]. Doty R, Sukhani R. Ankle Block. Benzon HT, Raja SN, Molloy RE, Liu SS, Fishman SM, eds. Benzon's Essentials of Pain Medicine and Regional Anesthesia. 2nd edition. Elsevier; 2005. page 675/ chapter 78. Kay J, Delmonte RJ, Greenberg PM. Ankle block. Hadzic A, ed. Textbook of Regional Anesthesia. McGraw-Hill; 2007. 546-553/39. Wassef MR. Posterior tibial nerve block. A new approach using the bony landmark of the sustentaculum tali. Anaesthesia. 1991. 46:841-4. Sharrock NE, Waller JF, Fierro LE. Midtarsal block for surgery of the forefoot. Br J Anaesthesia. 1986. 58:37-40. Disclosure: Received consulting fee for: Merck.